Since past one week, a short video has gone viral over the social media, which has gravely incensed the emotions of the people of the tribal areas of Pakistan, particularly the Waziristan region. The video, which is approximately 4 minutes long, shows two Pakistan Army soldiers searching a make-shift bunker, and bringing out a “women” clad in traditional Waziristani dress, locally known as Gaankhat – a loose long embroidered shirt usually pink in colour. In the above-mentioned video, the two soldiers are shown to conduct a thorough body search and recovering the shell of an RPG from “her” possession. Later on, the said “woman” is forced to dance by the two soldiers. A close observation of the entire video would reveal that it was purportedly made by the army personnel in one of their camps or bunkers in the Waziristan region. Similarly, the “woman” seemed to be yet another soldier clad in woman clothing while continuing to wear Army boots, and dancing on the “whims” of the other two. It has been seen that fighting an asymmetric war is usually arduous and results in a protracted conflict, the success of which mainly hinges upon public support to win it. The core strategy of any counter-insurgency doctrine is to win the hearts and minds of the people, especially those belonging to the conflict zone. The tribal people stood up against the Taliban and paid a heavy price for their support to the government. Their support to the government was voluntary since it is the state’s prime responsibility to provide security and protection to its citizens. The said video has greatly hurt the sentiments of the Waziristani people. Within a few days of the release of the video, a public demonstration was held in Bannu on 17 May 2016. 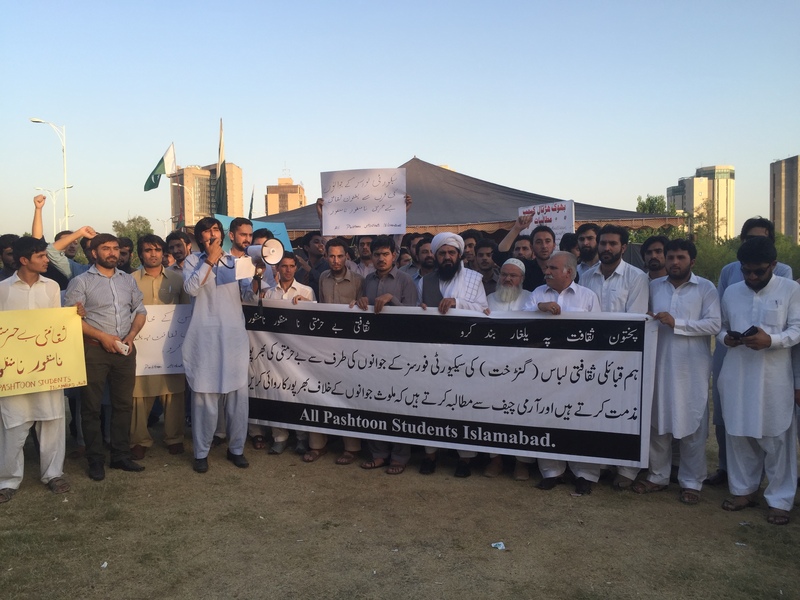 Soon afterwards, tribal students of the prestigious Quaid-e-Azam University (QAU) in Islamabad protested in front of Islamabad Press Club on 19 May 2016. Meanwhile, a grand Jirga of all the tribes of the Waziristan region has been convened on 22 May 2016 in Dera Ismail Khan (D.I.Khan) district of the Khyber Pakhtunkhwa Province (KP) to deliberate upon the matter and lodge a protest against ridiculing their culture, tradition and women. According to reports emanating from the area, the tribal elders of Waziristan vented their anger by saying that they have always stood by the Army and have sacrificed everything for the country, including their homes, ancestral lands and sources of livelihood and remain internally displaced all over Pakistan. Such a video, they felt, is a grievous insult to their identity, culture and traditions. They demanded of the government to conduct a detailed inquiry into the gratuitously insulting video and those who uploaded it on the social media. They warned that if the government fails to address the matter, the anger, alienation and helplessness among the people of FATA will increase in general and Waziristan region in particular. Azam Tariq, spokesman of the Khan Said aka Sajna Mahsud group also expressed his reaction over the said video, seemingly trying to drive a wedge between the people and the Pakistan Army. In his audio message sent to various journalists of the Waziristan region, including Sailab Mahsud, he said that Army has insulted the culture of Mahsud, Wazir, Daur and Bhittani tribesmen of Waziristan which would not go unanswered. He vowed to give a befitting reply to the Pakistan Army to avenge and restore the honour of the Waziristani tribesmen. Since 2003, Pakistan Army is in the throes of a protracted conflict in FATA which is far from over. The army has rendered enormous sacrifices in both human and physical terms. The people of FATA, especially Waziristan region, have equally suffered in this war, and have lost their near and dear, dwellings and belongings. More than 1 million tribesmen, including the entire Mahsud tribe, continue to remain internally displaced, and the prospects of their return and rehabilitation in the near future remain bleak. The said video is being viewed as deriding the Pashtun culture. Such irresponsible actions tend to negate the hard efforts which the government of Pakistan and the armed forces are tirelessly making to win the public to their side and isolate the terrorists and miscreants in the society. It is imperative that the top brass of the Armed Forces handles the matter on a priority basis and conducts a thorough inquiry into it so that those responsible for it could be brought to book and such incidents may not be repeated again.